Once a year, a quiet town in the hills outside Salt Lake City usurps Hollywood as the center of film and media. In just a few days, Park City will transform into a hub of filmmakers, actors, producers, and journalists looking for the next big thing in entertainment. Park City is an unsuspecting town. During the festival, its population quintuples. Blocks of hotels fill to capacity, forcing late-comers to find lodging an hour away in Salt Lake City or else rent whatever remains on Airbnb.com—in most cases, small mansions. In the forty years since the Sundance Film Festival began, the event has refashioned the landscape of Park City and reshaped independent film. Sundance is now more than a film festival. 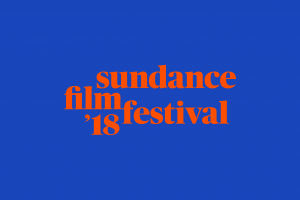 With the advent of programs like New Frontier and a host of panels and live performances, Sundance represents the seed of new ideas for storytelling. In recent years, New Frontier has become associated with virtual reality and augmented reality projects. That’s not where it began, though. New Frontier arose as a reaction to the proliferation of digital technologies affecting filmmakers in the early 2000s. “We realized our festival had to evolve with a rapidly changing landscape in emerging technology,” said Frilot. New Frontier was still relatively obscure among festival attendees in the mid-2000s. That changed when the economy collapsed in 2008. Entertainment was hit hard during the recession. Attendees and artists turned to programs like New Frontier looking for answers. 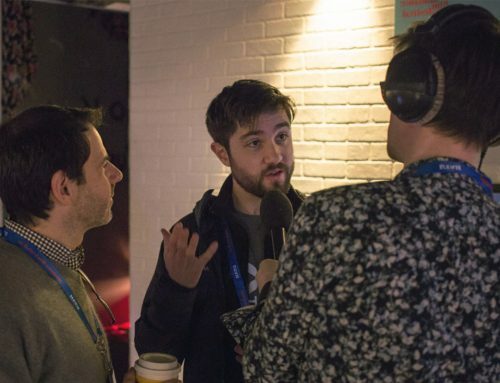 The program developed partnerships with entrepreneurial Hollywood influencers, such as Joseph Gordon-Levitt and James Franco, who were interested in how the convergence of art, film, and technology would affect how we tell stories. A few years later, New Frontier saw its biggest transformation yet with the debut of the Oculus Rift prototype. For the storytellers who find their way to New Frontier, there’s a compatibility of understanding in what HaptX is doing and why they’re doing it. I’m excited by how people will take to what HaptX does. Nonny de la Peña introduced the world to virtual reality storytelling at New Frontier in 2012 with “Hunger in L.A.” The piece used an early prototype of the Oculus Rift, which would launch its record-breaking Kickstarter several months later. “It was easy to see what a profound innovation this was for storytelling,” Frilot said. “Most media at New Frontier had until then leveraged existing technologies that were growing incrementally. “Whatever people say about how much VR has or hasn’t met expectations, you still can’t avoid calling it a unicorn,” added Frilot. Sundance’s New Frontier helped launch what’s become a multi-billion-dollar industry. Despite its smashing success at the show, virtual reality lingered in the shadows for a few more years. It was waiting for creators to access the hardware and start producing content. In 2015, Shari and the New Frontier team decided to push it to the program’s foreground. “We had to go out and find the content for that show, piece by piece,” Frilot said. “We had always been at the intersection of the practices where VR came from.” In the early days, content was coming from filmmakers, game designers, journalists, and performance artists who each had a vision for the medium. New Frontier was about pulling together the disparate creators and content to generate a more complex conversation around VR. A part of the selection process is also an intuition that comes from her background as a filmmaker and conversations with filmmakers that tell her what they’re excited about. Sundance remains a film festival, even as it pushes the boundaries of what film means. In the six years since the Oculus debut, New Frontier has hosted the gamut of content and performances. Extraordinary technologies like Oblong’s gestural interface or the Oculus Rift have sprouted into multimillion dollar industries. The latest breakthrough technology to debut at the show is HaptX’s haptic device. Once Frilot identifies a candidate for New Frontier, the real test begins. 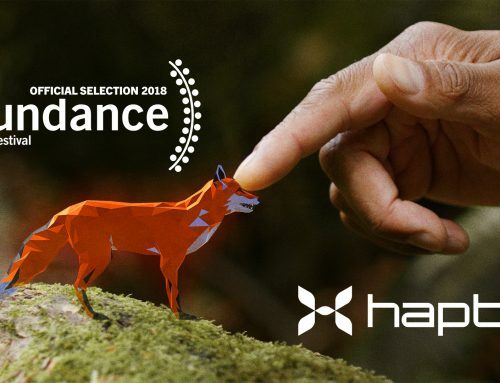 HaptX visited the office twice and demonstrated its technology for a wide spectrum of Sundance Institute employees. “My colleagues are pure film enthusiasts,” Frilot said. “They’re the roughest jury because if it doesn’t play by them, it’s not going to play at the festival.” The challenge, she explained, is there’s increasingly an audience at the festival explicitly for New Frontier. She wants to ensure this audience remains engaged with films as well as the experimental media in the program. The storytelling at New Frontier increases in sophistication every year. 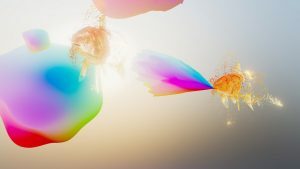 This year’s VR and AR projects leverage technology to create layers of narrative that were largely absent in previous years. At the same time, New Frontier continues to push the boundaries of storytelling using new technologies like artificial intelligence. TendAR, for example, uses augmented reality on your phone to let you interact with a fish who eventually becomes sentient. Frankenstein AI: A Monster Made By Many is a participatory experience that allows up to eight people to collectively create and interact with an AI. A still image from TendAR by Samantha Gorman and Danny Cannizzaro, an official selection of the New Frontier Exhibitions program at the 2018 Sundance Film Festival. Courtesy of Sundance Institute. HaptX is exhibiting two pieces of technology from its lab at New Frontier. The first is its HaptX Glove prototype, which simulates the feeling of virtual objects with incredibly precise fidelity. A VR user can use this interactive haptic glove to feel and experience the virtual world in the same way he or she would experience the real world. HaptX is also sharing the HaptX Thermal Demo, an R&D project that demonstrates the technology’s ability to provide responsive feedback with hot and cold temperature. For example, you can grab a virtual ice cube and it will feel cold. If anything has changed at New Frontier since its inception, it’s the speed at which media and entertainment are evolving. Technology continues to open new avenues of storytelling, but the technology today is more varied and more convergent than ever before. Frilot says HaptX is that bleeding edge.